Elementaire chair by Ronan & Erwan Bouroullec for Hay. A new bluetooth speaker in two sizes from IKEA. Lovely packaging for seed company Piccolo by Here Design. A series of photographs by Alastair Philip Wiper taken inside some of Adidas' factories. Flying shelves designed by Mario Tsai for Ferm Living's 2018 collection. The new Mercurial 360 boots from Nike, completely OTT. The Geodome 4 tent from The North Face is a four-man tent with a height of 210 cm for people to stand up in. The floor size measures 230 x 218 cm and it weighs in at 11.07kg. New England home and away kits for the 2018 World Cup, but the best has to be the 80s inspired training kit! New designs for Nikari on show at Stockholm Design Week. A new fabric by Inge Sempé for Almedahls. Piano tiles by Ronan & Erwan Bouroullec for Mutina. Ubco's 2018 model, with near-silent electric motors in both wheels. The first of Muji's new hotels, described as an "anti-gorgeous, anti-cheap concept". The hotel has 79 guestrooms, a gym, a diner, three meeting rooms, a library and a shop. A less serious alternative to Knog's new lights are the Curve lights from Bookman. 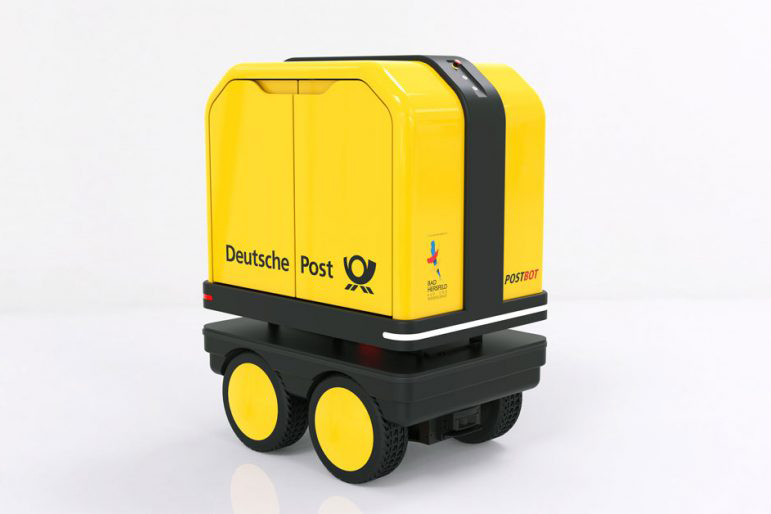 Deutsche Post is currently testing these autonomous PostBOTs. Adventure Tape, a polyurethane tape with many different uses, more than tripled it's target on Kickstarter. Selected winners of the Good Design Award 2017. See the whole list here. Knog's new PWR range is a modular system featuring a power bank and lots of different lightheads and other accessories. Lights patterns can also be customised using an app. The Stratosphere Sport track pump from Fabric. Lots of great cycling luggage from Restrap.